Hi friends!Nothing can beat the satisfaction that a glass of home lassi offer. Go ahead, drink up! Put curd, salt, cumin powder, ginger powder, black pepper powder, green chili pieces in a blender jar, blend the ingredients very well. Add water and crushed ice, blend again. Serve chilled in glasses garnishing with fresh coriander leaves. Can be refrigerated and stored for a day or two. Curd improves the digestion, the nutrients present in curd are easily absorbed by our digestive system. It also helps in absorbing nutrients from other food items that you have eaten. When taken along with spicy food, it cools down and neutralizes the heat that these foods create. Some people, who cannot consume milk because they are lactose intolerant, can safely use curd as milk substitute. It converts the lactose present in milk to lactic acid, making it easier to digest. Also, we do not lose out on the nutritional boost that milk provides us. 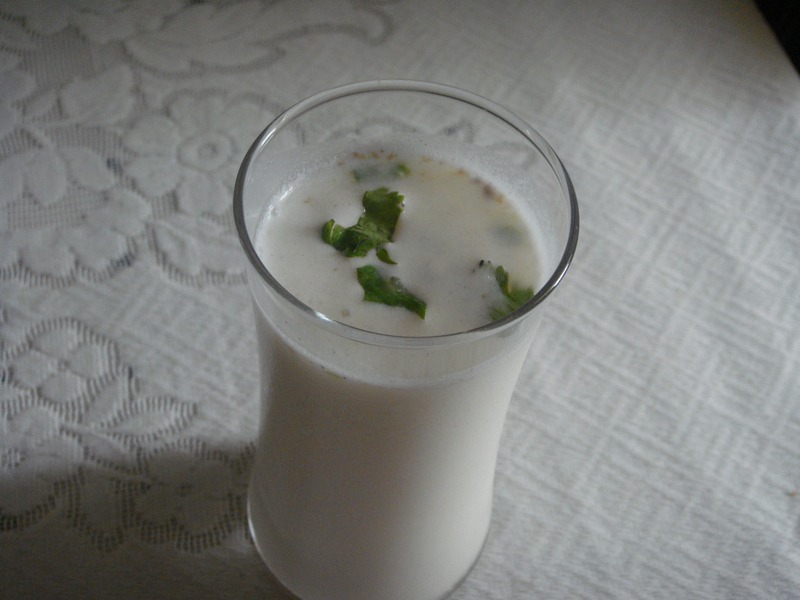 – Buttermilk has acid in it which fights germs and bacteria and helps clear stomach and aid digestion. – It is very helpful for those who are looking to lose weight. – It is a rich source of Vitamin B12 and so is believed to help fight anaemia and stress. – Since it contains electrolytes and lots of water, it is the best treat to give to your body to fight dehydration. – After having a heavy, oily and spicy meal, buttermilk works best to drain out excessive fat from the body and making your stomach light. – Buttermilk also works as one of the best remedies to treat acidity.